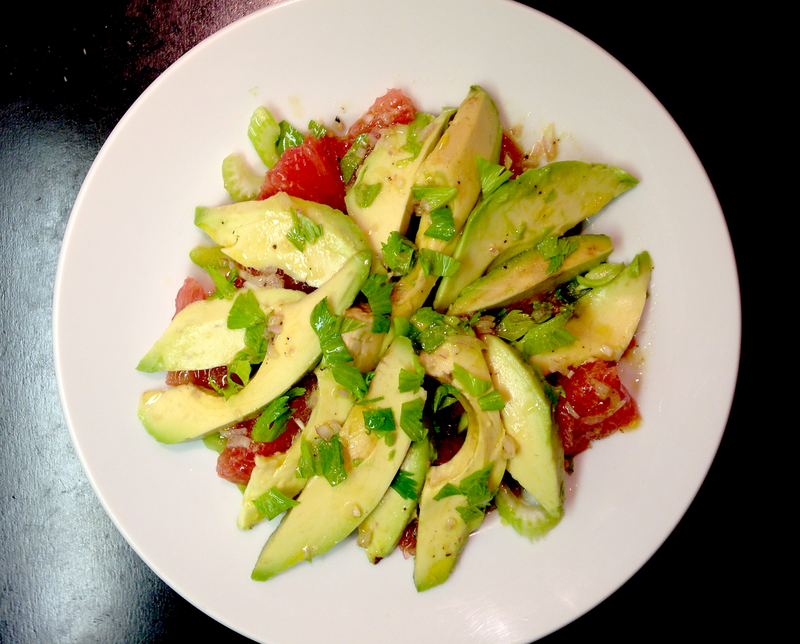 Make an avocado grapefruit and celery salad! The other evening, I wanted a salad, but was out of lettuce and most other common salad ingredients. I searched around the kitchen and found that I had a ripe avocado, a soon to be overripe grapefruit, and some celery that was on its way to becoming a limp sad version of its original fresh crisp self. Avocado and grapefruit are a popular pair for salads. The fatty richness of the avocado marries perfectly with the tangy bittersweetness of the grapefruit. However, texturally, they're both a little on the mushy side. Celery seemed like it would offer a welcome contrast to those ingredients. Celery really isn't my favorite vegetable. I'll use it for a soup or a lentil dish and then I end up with 3/4 of a bunch leftover. It is soon forgotten in my vegetable crisper. But celery leaves are flavorful and bright with a slight bitterness to them. When thinly sliced, celery has the most satisfying crunch and texture. There's a natural saltiness to celery. Used in combination with other things, it can be surprisingly lovely. If I had had lettuce on hand, I wouldn't have experimented with the celery, but it was the perfect addition to the two fruits. The best recipes seem to always evolve from lacking the ingredients I normally rely on. As a last note, I think this salad would be a great vehicle for some kind of smokey salty meat or charcuterie. I would crisp it up in a pan, and serve it as a warm topping on the cool salad. With or without meat, this salad is an excellent starter to a nice meal. Start by preparing your vegetables. Thinly slice the celery and lay across the bottom of a large plate. Chop up the celery leaves and reserve. Supreme a grapefruit, here's how. The pith of the grapefruit makes it unpleasantly bitter, at least to my liking. If you're super into bitter, keep that white pith on the fruit. Cut your grapefruit over a bowl so that you can save any juices that escape as you are cutting into the fruit. If you really don't want to be wasteful, you can save the grapefruit peel and candy it later. Lay the sliced grapefruit over the celery. Slice up the avocado, and top the celery and grapefruit with the slices. Sprinkle the reserved celery leaves on top of the avocado. In a small bowl, add the apple cider vinegar, grapefruit juice, mustard, shallot, salt and pepper. Slowly whisk in the olive oil until the dressing is thick and emulsified (has come together). Here's the thing about dressings... I never measure any of the ingredients when I add them together. I always make my dressings to taste, and I taste the mixture each step of the way. Vinegars differ, juices differ, oils differ. Each one has its own unique flavor profile and level of acidity. I start with the amounts I think will produce the right balance of flavor. If it's too tangy, I add a little sweetener (agave or honey). If it's too oily, I add a little more of whatever acid I'm using. I dip a vegetable into the dressing to taste it before I dress the salad I'm making. Don't be intimidated by dressings; no exactness is necessary. They're fun, easy, and once you start making them you'll get better and better at creating the perfect balance of flavors.